Great Virginia Beach Picture possibilities! US Beach Vacations Blog - What's New? in the immediate Virginia Beach area. Nearby Virginia Beach Pictures & Day Trip Pictures - Album 2 + "Reviews" and Tips - includes Newport News VA, Yorktown and Jamestown - Places of Interest and Attractions within 90 minutes driving time. Preview and have option to download from over 80 popular large High Resolution 1 - 4 Meg Images from this Site and our other 2 US Vacation Sites -- see our Thumbnail images free preview box near the bottom of this page below the Virginia Beach Boardwalk Pictures. - many Virginia Beach picture opportunities from condo balcony! Great vacation beach for all ages - the best of the Virginia beaches for fun activities! 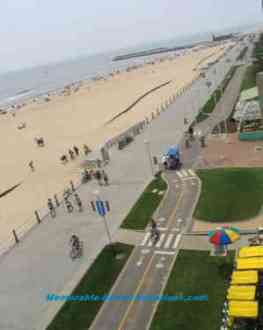 Could have a lot of people there and not notice crowds because of unique "3-part" Beach/Boardwalk/Bicycle Path design which can handle a lot of Virginia Beach vacationers. 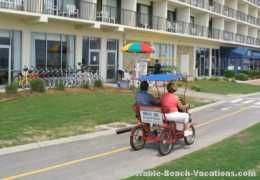 Rent a 4-wheeled bicycle for the family and pedal the beach front Bicycle Path adjacent to the Boardwalk. Large clean sand beach area + still plenty of room on 3 mile long boardwalk for people to walk + seperate bicycle path for 4-wheeled and regular bicycles to wheel along. Tip: Having an Ocean front balcony is particularly fun at Virginia Beach because of all the Boardwalk activity that goes on -- in addition to the great Virginia Beach picture view. Virginia Beach Picture taken looking north on 3 mile long Boardwalk Resort area toward pier. Nice railing on Boardwalk which was raised 3 - 4 steps up from the wide sand beach. Virginia Beach is handicap accessable. We were concerned when we came that it was going to be a more crowded beach area than we normally like, but the unique "Boardwalk design" and the wide beach area made it so the crowds were spread out over the 3 types of walking or biking areas. Boardwalk is a great Virginia Beach Picture area. Virginia Beach Boardwalk - Evening on Boardwalk. A few people still wander, roller blade, and bicycle up and down the three mile long Boardwalk in the evening. Well lighted and seemed secure. Three mile long Boardwalk runs in front of Resorts, Condos, and Restaurants adjacent to wide beach. Many park benches to relax and watch the ocean or the pedestrians from -- and nice landscaping in front of Resorts. Very clean and well kept. Plenty of Virginia Beach picture opportunities -- people watching is fun too! Virginia Beach, VA - Clouds at Sunset after a brief shower that day. Got some good Virginia Beach Sunrise pictures from Condo Ballcony too. We will go back! 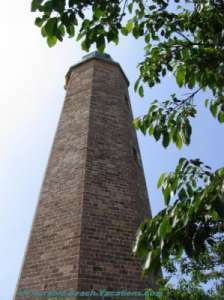 -- Many interesting "Historical" things to see in area. More than you can see in 8 days. Tip Use Timeshare Exchange or Rental week and add one or more Bread & Breakfeast days. Virginia Beach Boardwalk - Notice man washing off his dogs under shower head in middle (Easier than at home in the tub, right?) 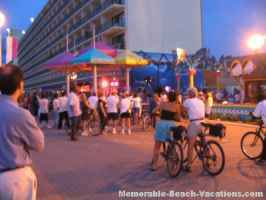 - Showers were placed at most intersections where there was an opening back to the street behind the Resorts along Boardwalk. Made it easy for people to wash off sand as they came off of the beach back up to their Resort - Dogs weren't allowed on sand beach area. Tip: Take your camera whenever you go walking on the Boardwalk -- you almost always see a " Virginia Beach picture moment " when walking on the Boardwalk! My wife just liked to relax on one of the many park benches and watch the people go by. Virginia Beach wide sand area- Picture of expansive sand beach taken looking north toward Virginia Beach Pier at 15th Street. Tip: We were there in late May before the schools were out. During the week beach was not crowded at all. Some influx on weekend, but never was really crowded. This sand beach area is so wide between Boardwalk and Atlantic Ocean that it could handle a lot of people without "feeling crowded." Boardwalk with seperate bicycle path "spreads out" the traffic there. See our Thumbnail images free preview box below the pictures. 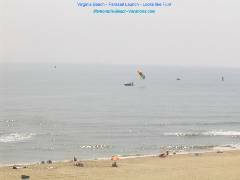 Virginia Beach, Virginia - We had two ParaSail boats that were starting up right in front of the condo where we stayed. This one was just taking off - Virginia Beach picture taken from 6th floor condo balcony. Sometimes they would go out fairly far and get the "Parasailer" up very high - reminds me of the TV commercial. Often they would both have someone up at same time. My wife is the 2nd from the right on the beach on a beach towel -- you'll recognize her if you happen to meet her from this Virginia Beach picture of course! Virginia Beach Boardwalk - Bands or vocal groups set up outside the Restaurant many evenings - many passing by stop and listen for a while. This turned out to be a very popular Virginia Beach Picture. Preview for free & have option to download a large 2+ meg high resolution & suitable for commercial use file version of this picture and over 80 others at the "Thumbnail" picture box below. Old 1791 and "new" 1881 replacement lighthouses are within a few blocks of each other. We climbed the approximately 160+ steps from behind the LIghthouse gift shop up to base of Lighthouse with great views of the Chesapeak Bay and nearby shipyards -- and another 170+ steps up the spiral metal staircase to the top -- a lot of steps!. Great view in all directions at the top! The view includes the "New" 1881 lighthouse next door, the old lightkeeper house, a modern electronic ship "control tower" and the Atlantic ocean. "New" 1881 lighthouse now has electric light vs oil burning lantern. See a Preview High Resolution Photo version of this picture and over 35 others at the "Thumbnail" picture box below. Tip: Drive down to the beach nearby and look at the 1607 Captain Newport memorial. Also access to a interesting area of beach used for Military "landing" training with a great view looking back at both the old and new Lighthouses a few blocks away. Great Virginia Beach picture opportunity. - Could get a high view of the beach from the Ferris wheel. Only operated on weekends and in evenings when were more potential customers. This is another popular Virginia Beach Picture. Free Preview + option to download a large high resolution printable and suitable for commercial use file version of this picture and others at the "Thumbnail" picture box below. - 4 wheeled bicycles were a big hit - could rent 2-4-and 6 peddler versions at many resorts up and down the strip. Seperate bicycle path next to boardwalk so everyone has their own space. Great family vacation beach fun for all ages. - The mile long north edge beach area fronts onto Chesapeake Bay. Beach use is for overnight guests only. Many Camping Sites and RV Camper Sites + 20 Cabins. - Most popular Park in Virginia, so get your reservations in early! Unique park with something for everyone - Virginia Beach Campground "hidden" at north end of Virginia Beach VA. Many great options for Virginia beaches and great Virginia Beach pictures in the area. More on some great area Beaches near Virginia Beach including First Landing Park on our "Other" Virginia Vacation Beaches page. Semitropical forests with large cypress trees, lagoons, and 19 miles of hiking and self guided nature trails + a beautiful bicycle trail at this Virginia Beach Campground. Will find many subjects for your Virginia Beach Picture album. Please send us your "Top Picks" if you have Virginia Beach picture favorites or attraction pictures you think would be good for this page. Take a fun Virginia - or wherever - US mini-Vacation. Check out the highly discounted Getaway Vacation Lodging Packages on our Timeshare Vacation Promotions page - direct Links to popular Vacation Getaway Discount Deals from $79 - Many include free Attraction Tickets. -- Includes Newport News, Yorktown and Jamestown - Places of Interest and Attractions within 90 minutes driving time - Great Day Trips and near Virginia Beach picture possibilities! 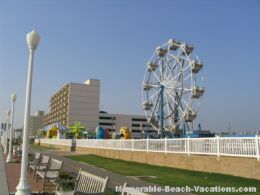 Read candid user reviews and get over 88 oceanfront and off-ocean Virginia Beach Resorts ranked by popularity with comparison pricing at this link: Find the best deal, compare prices and read what other travelers have to say at TripAdvisor for Virginia Beach Hotels & Vacation Condo Rentals. Large High Resolution Photo Favorites from our 4 US Vacation Sites! Click this link or the image below to View a Popular selection of over 90 Previews of High Resolution Images from this Site and our "sister" Mountain-Fall-Foliage-Vacations Site + our NebraskaTravels Site (See GoUSVacations link at bottom of this box if you want to also check those sites out) - High Resolution, Non-Watermarked Photos available for download. 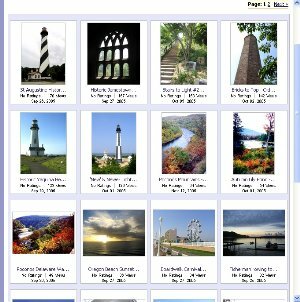 You can Preview Large size, High Resolution, Downloadable and Printable / Frameable or Commercially Usable 1 to 4 Meg .jpg file versions of over 90 of the special Favorite Photos on all 4 of our "Picture Enhanced" US Vacation Sites. Previews and "Comp" downloads are free. Check them out and you will find that the Royalty-Free High Resolution Photo Download purchase prices are very reasonable. Watch for more Pictures to be added. Free "Comp" download Photos are available - perfect for screensavers or wallpaper. Tip Our GoUSVacations Page has descriptions, page listings, and links to all 3 of our "picture enhanced" US Vacation Web Guide Sites + their Photo pages. Virginia Attraction & Discount Travel Tips for the 50+ Crowd - Includes Car Rental Discounts - "over 50ers" and the "Seasoned Citizen" Senior Set often can get some special discounts we talk about here! We are adding Pictures, reviews, and Tips somewhere on this site almost daily. We are doing our best to ultimately make this site one of your most Interesting, Fun, and "Picture Enhanced" Virginia family vacation beaches and Discount Travels Tips Information Sources. We appreciate your suggestions or comments on our Your Top Picks & Comments Page. Thanks for checking us out! Bookmark us and come back soon to see what's new -- or better yet, get one of our RSS feed links above + "Like" this page at Facebook. Plus "Like" us at Affordable Beach Vacations on Facebook plus post on our "Wall" to keep in touch. Please also send us any comments on individual Virginia Beach Area time share oceanfront Resorts where you own week(s) or have exchanged to + local Virginia Beaches attractions you enjoyed. Even good Bed and Breakfast Inns you have stayed at. Attached Virginia Beach picture files to go with the comments are always appreciated! To send go to our Your Top Picks & Comments page. Thanks! Virginia Beach Time Shares Guide ( + All Time Shares) - WHY Timeshares? Do they REALLY save you Vacation Dollars? How about Time Share Rentals?